Our chia seeds are grown and sustainably harvested in the Andean mountains of Peru. 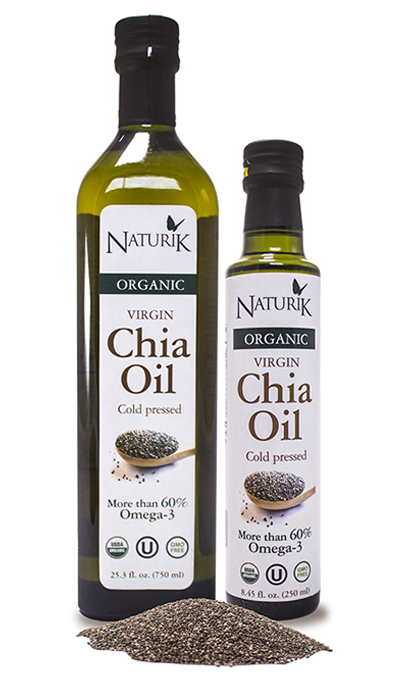 Our chia oil is obtained by cold pressing the seeds. • Contains more than 60% omega-3 ALA.
• It has an ideal balance between omega-3 and omega-6 (3 to 1). • Non-GMO, Gluten-Free and Cholesterol Free. Due to its mild nutty taste, it can be consumed directly 1 or 2 tablespoons a day or use in salad dressings, vegetables, pastas, yogurts or smoothies. Not for use as a cooking oil. Store in a cold dry place, away from sunlight. After opened it is recommended to maintain close tight and refrigerated. 250ml (8.45 fl. oz.) and 750ml (25.3 fl. oz.). • 250ml (8.45 fl. oz. ): Organic Chia Seed Oil.